As my blog progresses, I would like to share with you some of the stories that other fellow pilgrims have sent me which I think are inspiring. Here is a letter from Deborah, who shares the story of her family’s involvement in helping to heal the wounds of the past in her hometown of Birmingham, Alabama. 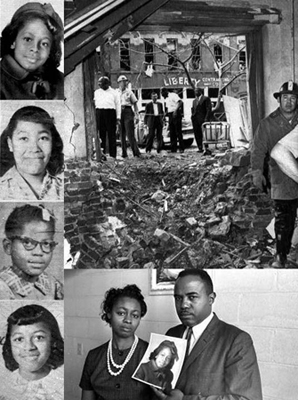 You can read more about the events that Deborah refers to in the article on the 16th Street Baptist Church Bombing in Wikipedia. It is a very shocking event, including the following laxity in obtaining a trial for the offenders. But Deborah’s letter shows that it is never too late to try to heal the wider big wounds that affect whole communities across generations. In contemporary Buddhism, this compassionate approach to connecting to others in a public way is known as ‘socially engaged Buddhism’. This means that although it is important to develop our own spiritual practice, it is also important to be active in helping to heal the collective wounds of the past by engaging in community action. racism in her native Arkansas. and I are determined to be in Birmingham next year as Sixteenth St.
is going to honour Mom during the 50th commemoration activities. This entry was posted in Inspiration and tagged engaged buddhism, letter. Bookmark the permalink. Had a little cry just reading this again…tears are good…tears are healing. Thank you for putting links to Sixteenth St. on your blog..just what I’d expect of a such a ‘socially engaged’ organised Buddhist like you! Do you know what I really really loved about your ‘Letter from Deborah’ blog’? The fact that you posted pictures of Addie Mae Collins, Denise McNair, Carole Robertson and Cynthia Wesley. It’s a point of honour with me that every time I talk about Sixteenth St., I name those four beautiful girls and to see their images was an honouring by you of their memory. I will be making a pilgrimage to see Bindi Cole’s Seventy Times Seven in Melbourne..forgiveness is in the air! Thank YOU Deborah, for sharing this beautiful story with us. I’ve had many personal replies and comments about how it touched people’s hearts. Yes, I think that when we see photos it makes the names into real people. Let me know about the Seven Times Seven if you see it – it’s a video and I’d really love to see it myself. The description Bindi gives about how she filmed it was very moving indeed (but I can’t find just now where that was!) If I find it later, I’ll leave a link. I promise to let you know about Bindi’s art installation/video. She speaks about its creation on one of the you tube links you kindly provided to your blog readers!